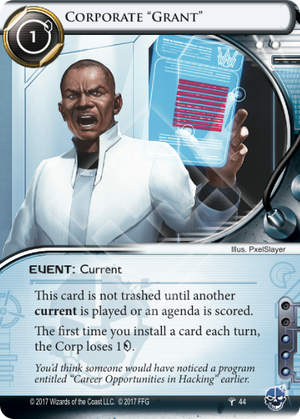 The first time you install a card each turn, the Corp loses 1credit. You'd think someone would have noticed a program entitled "Career Opportunities in Hacking" earlier. Finally.... a decent Current for criminals. Corporate Grant plays on a criminal strength - keeping the corp poor. Because of its trigger, it only truly shines in builder/horizontal decks. However, most criminals (e.g. Gabe, Ken, Los) are aggressive. They get their rig up fast, and run, run, run. Geist installs a lot of cards, constantly triggering the ability throughout the game. Counters Scarcity of Resources, which has shut down staple cards like Fall Guy, Tech Trader, and Street Peddler for a long time. You can use Street Peddler during the corp's turn, triggering Corporate Grant out of turn. Slows down Rush and FA decks, letting you build up before they can win. As a Criminal "main", it makes me proud to finally see a solid Current after several years.